One month itinerary Thailand : what to see? Hi everyone ! Some months ago I was in Thailand on my way back from Australia. I spent 1 month there and I’ve tried to see as much as possible and get a sense of this beautiful country without stressing and rushing. So today, with holidays coming soon, I would like to share with you my itinerary that could inspire you if you’re planning to go too. So let’s go : one month itinerary Thailand : what to do? We decided to spend 2,5 weeks in the South, and 1,5 weeks in the North, basically. 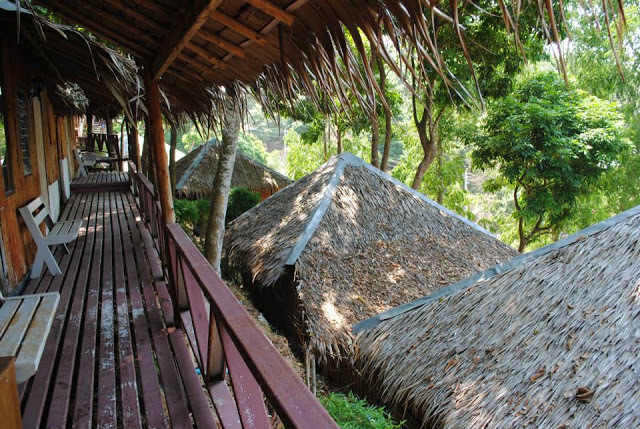 Starting with visiting all the beautiful beaches and islands, going up through the center and National Parks for some hiking, and ending up North to dive into the local culture. One month was the perfect time to do all that. I think you could even make it in 3 weeks. We had time to come back to the South at the end to fly back to Paris. We could enjoy the beautiful beach in Phi-phi island, shop nice clothes and sleep in a wonderful tree-Bungalow made in wood for so cheap (about 8€/night/p). You can really live a royal life in Thailand for an average budget. It’s great ! The great natural view from our tree-Bungalow 🙂 Not bad, right? 3. 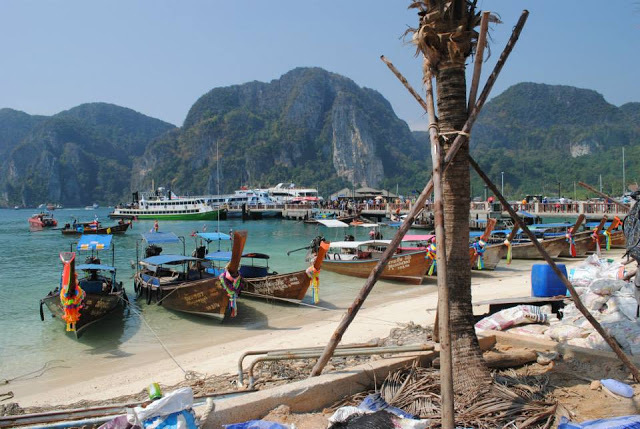 Take boat-tours from Phi-Phi Island to the beautiful places around. Bamboo Island (Local name Ko Phai): white sand, paradise beaches. You can’t be disappointed about this place. It’s a paradise on earth ! 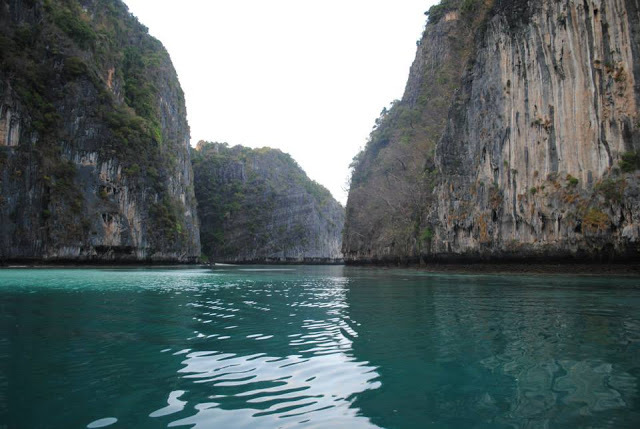 Maya Bay (local name Koh Phi Phi Lei): this is where the movie “The Beach” has been made. So beautiful ! There are a lot of tourists there though : be prepared to it ! 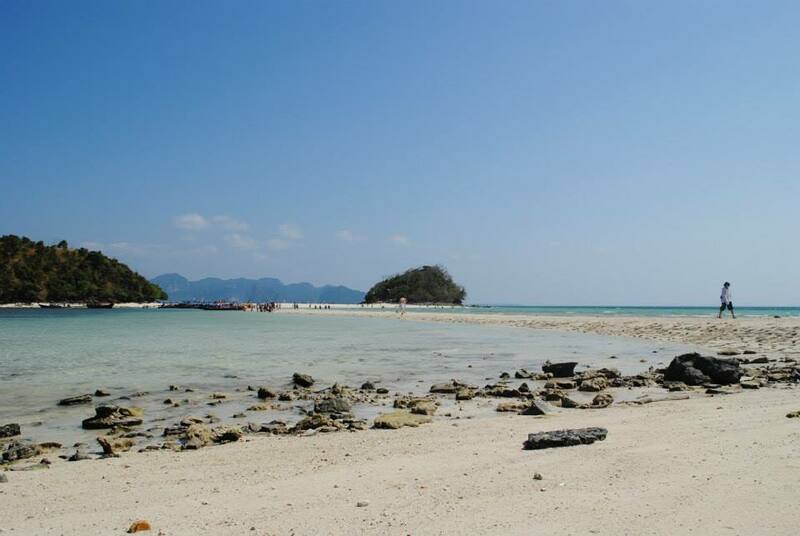 Mor Island (local name Kho Mor) – Actually 2 islands and when the tide is low you can walk from one to the other. Feels like walking on the water. Amazing experience! Pak Bia Island (local name Koh Pak Bia) with Cristal Water and a lot of resting on the agenda 🙂 You can see some monkeys going around. They’re so cute. But be careful ! They can be evil and steal your food or belongings. 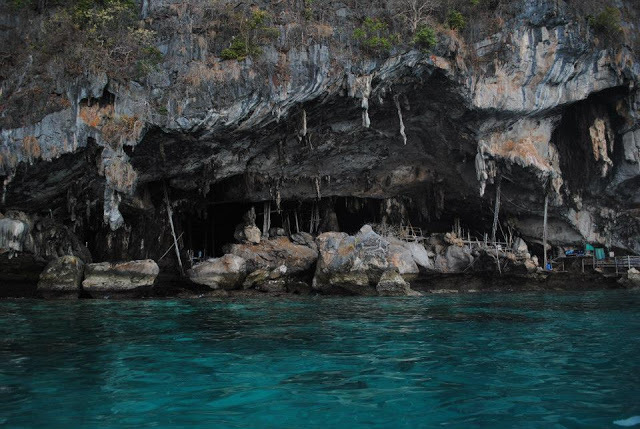 Talabeng Island (Koh Talabeng) : you can see stunning caves there and swim into them. Look at this beauty ! 5. Go to Khao Sok National Park. We took a minibus from Krabi to go there which was one crazy experience. Thai people drive SO fast ! We didn’t feel so safe but now it’s actually a good souvenir. It changes so much from the high security in our european countries. Anyway, this national park is amazing if you like hiking. Plan a whole day and good shoes for it ! 6. Go to Kho Samui. An Island not far on the East Coast. It’s really worth it. Still very nice beaches and wonderful landscapes for sure! 7. 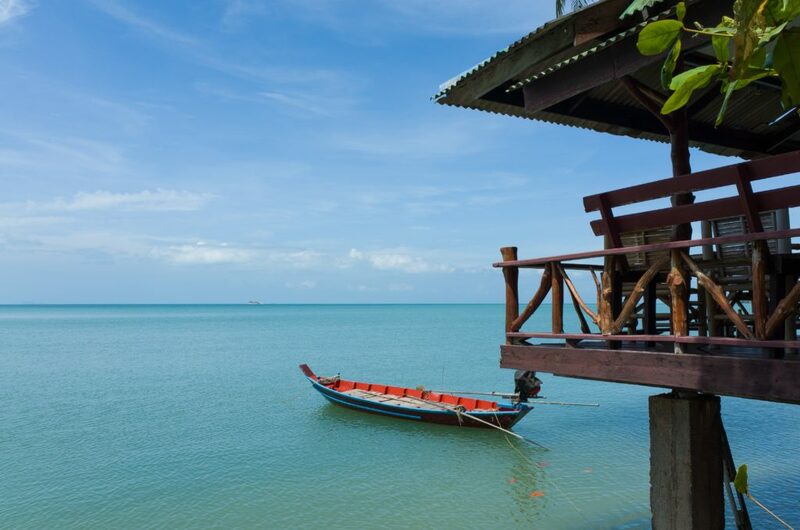 Go to Kho Pha Ngan. The party island. It’s super beautiful ! you can rent a scooter for so cheap and drive around to see lunar beaches with NO TOURISTS at all. We found an unbelievable beach where we stayed for a whole afternoon without seing anyone else than us two. So great! And it’s also where the SO FAMOUS FULL MOON PARTY is organised. You can’t miss it. If you miss the full moon party (which is once a month there) you can still party once a week for parties they organize in between. It’s very fun. You drink cocktails from buckets, and meet so many people from so many different nationalities. 8. You’ve seen most in the Southern part. You can go to Bangkok. The city that never sleeps. Allow at least 2-3 days there. Do so shopping (everything is so cheap), eat good food in restaurants and the various terraces they have and don’t forget to have a walk on Khao San Road (the craziest road in the world). I’ll let you see by yourself, don’t want to spoil. 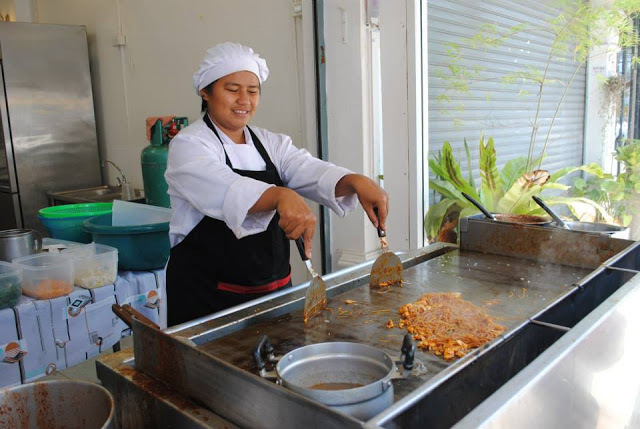 Don’t forget to get a cheap Pad Thai there , and a passionfruit juice. Delicious and cheap! 9. Go to Ayutthaya to see the temples. It’s a city full of old temples. A must see. The old temples are spread everywhere in the city so the best is to rent a bike to tour yourself. 10. Go to Erawan national park, probably the most beautiful one in Thailand. This park has a 7 levels waterfall, that you can basically climb up, and WOW… what a paradise on earth. I let you see by yourself on the picture below. A little story : on one of the waterfall levels, we swam in the water and got a real, natural fish pedicure. The fishes that beauty salons use were just living there naturally. W.O.W. 11. Finish with Chiang Mai. You can allow some time there. It’s a very nice Northern area where you can see typical villages. They have many tour operators that can guide you towards what you like the most. I would recommend to visit reserves where they take care of elephants. Be careful which one you choose and make sure that they don’t mistreat them. We went to Patara (not sure… the elephants looked happy and we google it before it looked good). I just hope this one was great. But… I don’t know. My feeling is not 100% sure… If you wanna make sure you don’t take part of animal violence, just keep avoiding elephant stuff. Especially when you ride them. Voilà ! I wish you to enjoy your trip in Thailand ! And don’t hesitate to post comments if you have any question. Lots of love and remember that travelling is the best thing you can offer to your soul. Next Post Program Berlin in two days : what to see ?